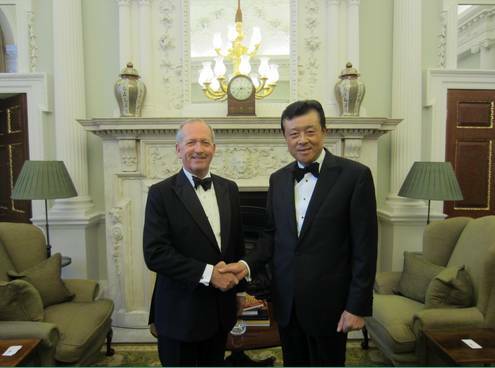 On 25 June, Ambassador Liu Xiaoming met with Lord Mayor of the City of London Alan Yarrow. They exchanged views on the financial cooperation between China and the UK. Ambassador Liu said that the China-UK financial cooperation in recent years has been full of highlights and opportunities. He hoped that the City of London, with a considerable edge in financial services, would to make greater contributions to further enhancing the financial cooperation between China and the UK. Chinese President Xi Jinping will pay a state visit to the UK this October, and the Chinese side is ready to work with the UK to make the visit a new milestone for China-UK relations. Yarrow said that the City of London attaches great importance and gives strong support to the cooperation with China. The City is ready to give full play to its unique features and strengths and take China-UK financial cooperation to a new level. The City looks forward to the state visit of President Xi this October, and will make every effort to get ready for the visit.